Were doooooomed! Actually, were not, we have been invited (weather permitting) to a stellar light show. Seeing a bright fireball blazing across the heavens is an awe-inspiring sight and can trigger a lifelong interest in astronomy. The meteor shower will peak in the early hours of Wednesday morning. August 11th. The Perseids happen every year in August when the Earth passes through rock and dust fragments left behind by a Comet. The Perseids are so called because the point they appear to come from, called the radiant, lies in the constellation Perseus. Meteor showers occur when Earth moves through a meteor stream. The stream in this case is called the Perseids cloud. 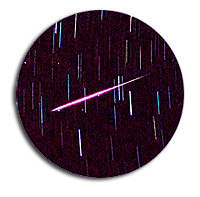 The Perseids are a prolific meteor shower associated with the comet Swift-Tuttle. As these small particles collide with the Earth's atmosphere, they burn up, creating up 80 streaks of light an hour across the night sky. The cloud consists of particles ejected by the comet as it passed by the Sun. Most of the dust in the cloud today is approximately a thousand years old. Weather permitting 9 to 11 p.m. your local time should be the best time to see it. Lie down and look up. Perseids can appear in any part of the sky, the meteors can come from any part of the sky but the tails will always point back the constillation Perseus. The moon will be out tonight in Aries and this may make viewing harder so the time above should have the moon low on the horizon. Be careful out there alright . . .